June 4, 2010 7:30 p.m. Lately you might think it's been tough for Sherry, with the yelling and the stitches and the scars and all, but she's been great, truly great, actually she's never been better, and now she's going to prove it to y'all. On June 4 and 5 at 177 Livingston, Sherry will host her own event, Sherry tries on Cinderella, and show you what Southern hospitality is all about. Hearts, balloons, candy, booze, cake, music, glitter, kitchen knives—it'll be a fairy tale, a therapy session, a dance party, a triumph. 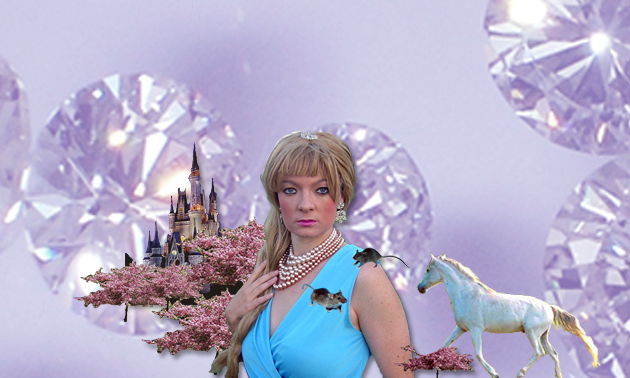 In Sherry tries on Cinderella, Sherry will be presenting fragments of her newest performance, Cinderella, which premiered in Sweden in April and will be performed in full at an abandoned house in Jersey City in late August/early September. Sherry's interpretation of Cinderella is set to be Ann Liv Young's most personally revealing and explicit work so far. Alongside performance excerpts from Cinderella, Thomas will debut his DJ skills, a bar will provide a steady flow of alcohol, and exclusive Sherry memorabilia will be available, including T-shirts, jewelry, DVDs, and the opportunity to get a personal photograph with Sherry herself. Come along, meet Sherry, hang out, get loose, and decide for yourself what you really think. She can take your honest opinion—she can take anything.